Into the Wilds of Quebec - Contrasting VIA today with memories of a CN trip in ’74. There was something that intrigued me about those CN trains....and I wanted to ride: old heavy-weight section sleepers, (the Pullman kind with upper berths, lower berths & curtains) steam heat and remote stops in the wilds of Quebec. So just after I graduated and started working.... now with a little extra money to spare......I planned out a trip that would let me sample those trains along with a few other routes back in November 1974......and it turned out to be quite an adventure! I left home in Nova Scotia on CN’s Cabot. Arriving in Truro, the ‘DayNiter’ I was travelling in was added to the westbound Scotian for the overnight run to Montreal. 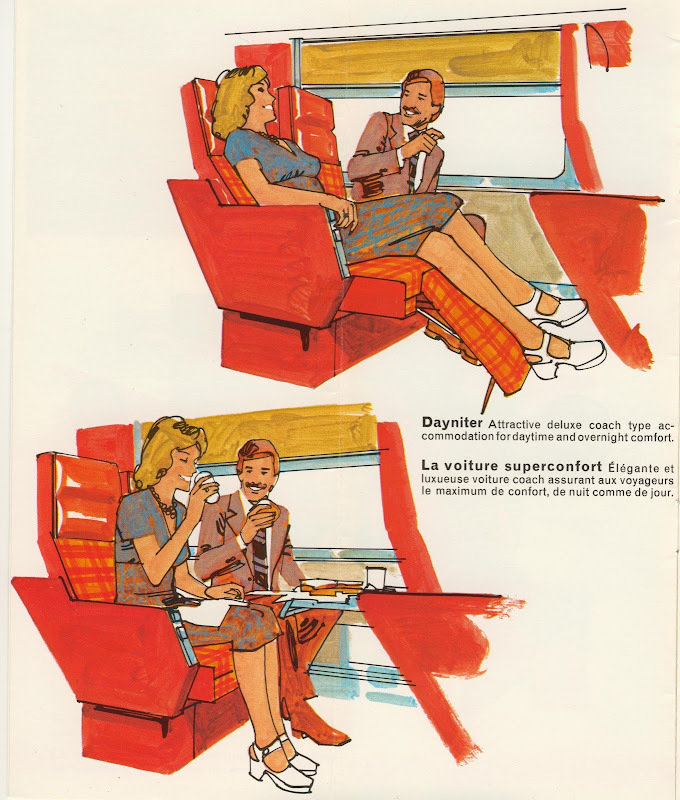 A ‘DayNiter’ was a step above regular coach.....but certainly couldn’t replace the through Sydney-Montreal Sleeper that had recently been discontinued. At breakfast the next morning I was hearing rumours about a rail strike in the Montreal area and the possibility the Scotian would be stopped short and passengers bussed on. Before arriving in Levis at 11am I went to speak with the conductor and explained I was taking the train from Montreal to Cochrane that evening. He said the strike was only affecting the Montreal area and I should get off in Levis and take the Cochrane train from Quebec City instead. The two trains would have met up at Hervey Jct later that night anyway.......I was just going via Montreal for the mileage run! Levis is across the St. Lawrence River from Quebec City and connected by a short ferry ride leaving right from the CN Station. (the photo below is looking back at the Scotian from the Ferry) Once on the other side, I walked the short distance to Gare du Palais and the ticket agent said there would be no problem using my ticket via Quebec. He changed my sleeper reservation and even offered to store my things for the day. Last edited by NS VIA FAN on Mon Jun 27, 2016 5:36 am, edited 3 times in total. About 8pm I headed back to Gare du Palais to just sit and wait. At 9:30 I heard ”passagers voiture–lit” (sleeping car passengers) and I walked forward. There were about 5 of us......and we get the bad news: The old heavyweight sleeper in the consist wouldn’t in-service that night. The porter for this car usually comes up from Montreal on the evening Rapido and with the strike on......no Rapido......no porter! We were allowed out to the train and including the coach passengers......not that many at all! The conductor took pity on us and turned the seats so everyone would have a four-seater to themselves.......he even went back to the sleeper and grabbed an armload of pillows! So after walking around the city for 8 hours, the car was warm, the lights were dimmed.....it might not be the lower berth I was expecting but that coach was pretty darn comfortable! About 2 hours out of Quebec we stopped at Harvey Jct and just sat........ Normally this is where we would have meet #73 up from Montreal (the train I should have been on) and would have spent an hour or so switching and exchanging cars.....with #73 continuing onto Chicoutimi..... and us onto Senneterre. After that, I slept pretty well. The next morning I found out there was no attendant in the lounge car either (also from Montreal) so no coffee. The conductor said we would be stopping just up the line in Clova for 20 minutes so everyone could walk over to a local store.......and I can remember getting along pretty good with my high school French as I came back with a coffee, pastry and fruit for breakfast. CN #75 arriving Senneterre on Nov. 8, 1974. - 8108 and 5425 were added to #175 for Noranda-Rouyn. And finishing out the schedule of #75 to Cochrane were: 6761, 8126 (Express added at Senneterre) and just a single coach.....#5389. Last edited by NS VIA FAN on Sun Jun 26, 2016 10:57 am, edited 1 time in total. It was dark now on a late fall afternoon when we arrived at the joint CN-Ontario Northland Cochrane Station.....and an hour for supper in the Station Restaurant before the'Northland’ arrived at 7pm. The ‘Northland’ was another train that underwent quite a transformation along the way. It departed Kapuskasing (Kap-us-kay-sing) on CN. The Ontario Northland Railway took over at Cochrane..... then it went back onto CN at North Bay for the remainder of the run into Toronto. And as it made its way south, the consist expanded considerably. -Train originated in Kapuskasing on CN with 6791, 410, 1190 & 821. -At Cochrane ONR took over and 4885 was added. -Coach 810 & sleeper 2091 thru from Timmins were added at Porquis Jct. -FP9a1500 & sleeper 2100 thru from Noranda were added at Englehart. I had a roomette in ‘Green Gables’ a former Bangor & Aroostook Railway sleeper. 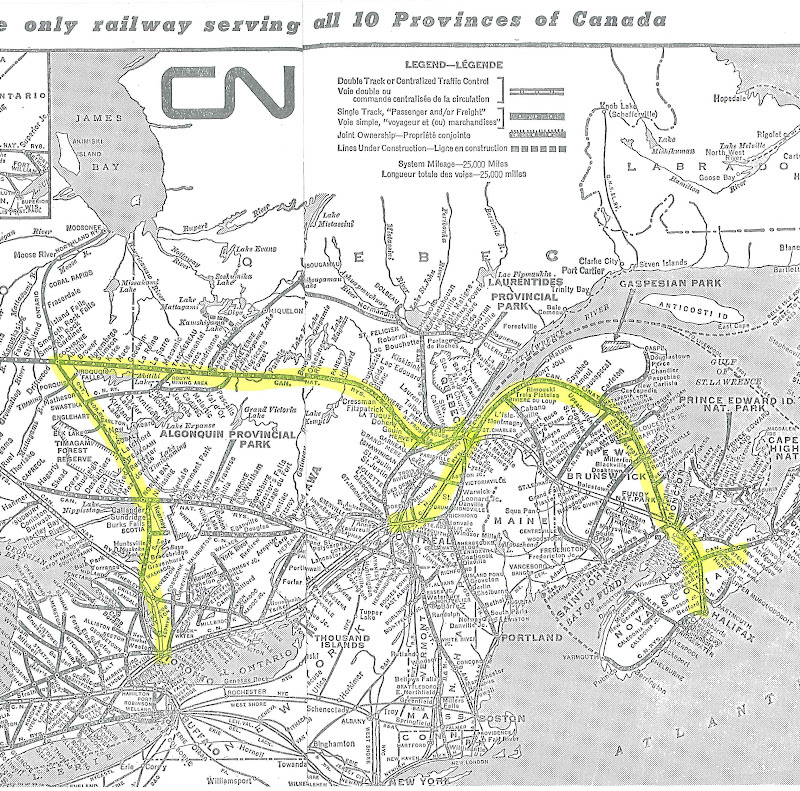 I wanted to stay awake for North Bay to follow our route through that city......then an important junction on the east-west CN & CP transcontinental mainlines, crossed by the north-south ONR-CN route. But the comfortable roomette following the previous two long days and nights in a DayNiter and coach.....I just slept right through. We arrived in Toronto at 7:30am and I went to the ticket counter to see if there was any word on a settlement in the strike. Nothing......but they did hope to be running to Montreal that afternoon so I spent the morning riding the TTC Subway and Streetcars.....and GO Commuter Trains out to Pickering and back. Arriving back at Union I noticed the TURBO sitting in the station and after a brief moment of thinking I might be on my way.......another disappointment.........No, nothing would be running to Montreal......but if I could get to Levis, the Scotian I had a reservation on would be leaving from there early the next morning. So now instead of the 4 hour TURBO ride I was looking forward to, I found myself on a 6 1\2 hr (340mile) bus ride to Montreal. A 3 hour layover there then back on another bus for 3 hours and 160 miles to Levis.....arriving at 1 am. I wasn’t the only one trying to connect with the Scotian so the bus driver even went out of his way to drop us at the CN Station. But when we walked in the Agent knew nothing about the Scotian running east from there that night and could only offer us free tickets back to Montreal on the westbound Ocean from Halifax due in 3 hours at 4am. They did hope things would be settled and they could run all the way into Montreal. But not so.......when we reached St. Lambert just across the river from Montreal.....the picketers were blocking the tracks and they bused us over to Central Station. That’s it!..... Enough!.....and I headed out to Dorval to fly home. Eastern Provincial had a’737 to Charlottetown, Prince Edward Island then onto Halifax. In the photo below.....as we started down into Charlottetown I spotted the CN railcar ferry making its way across the Northumberland Strait. After the quick stop on PEI ....it was over to Halifax for a late afternoon arrival. I had plenty of time to get a bus downtown to a busy CN Station to catch a Railiner for home. We stopped briefly in Truro where we should have met the eastbound Scotian from Levis and Montreal (he train I should have been on) Then the Railiner continued onto Stellarton and I actually arrived home, on time, on the train I had planned to be on in the first place! Now let’s fast forward a year and a bit and I finally did get to ride CN#73 out of Montreal Central Station but this time heading for Chicoutimi and again crossing with #75 at Hervey Jct. *6712 & *6714 were ancient GE Electric Box Cabs. They hauled the entire consist out of Central Station through the 3 mile Mont Royal Tunnel. At Eastern Jct. the electrics cut off and returned down into Central Station. CN 6712 & 6714 had been in service since the Tunnel opened in Oct. 1918 and were actually still hauling commuter trains nearly 80 years later on the last day of operation in June 1995. The Mont Royal Tunnel (now AMT’s Deux Montagnes line) reopened later that year using new Bombardier Electric Multiple Units. 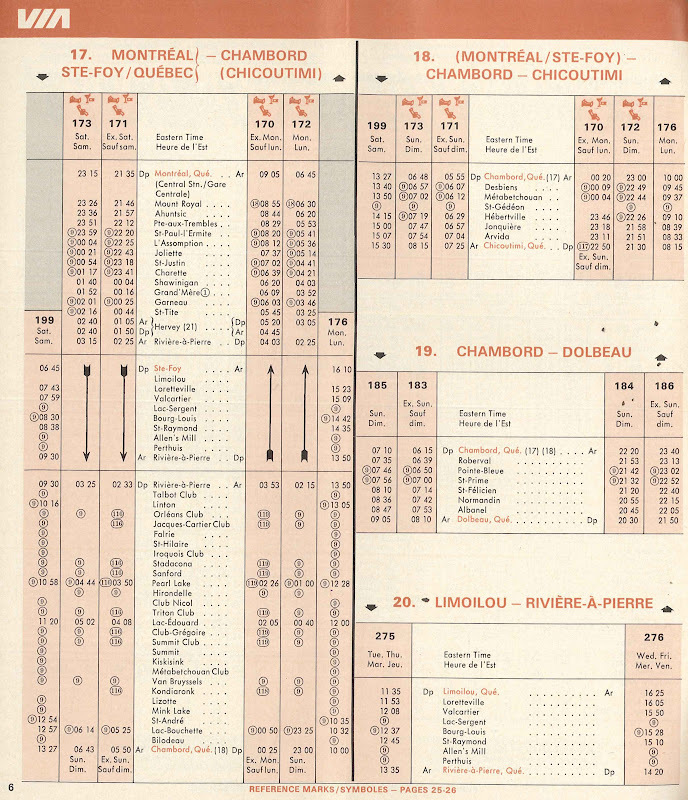 Today’s VIA #601/605-#603/607 follow a similar route: Montreal to Hervey Jct where they split into sections for Jonquiere and Senneterre but no longer exit Central Station through the Tunnel. They now follow a route west through the city and around Mont Royal....to rejoin the original route at Eastern Jct just north of the tunnel. Thanks for taking the time to post all the photos. 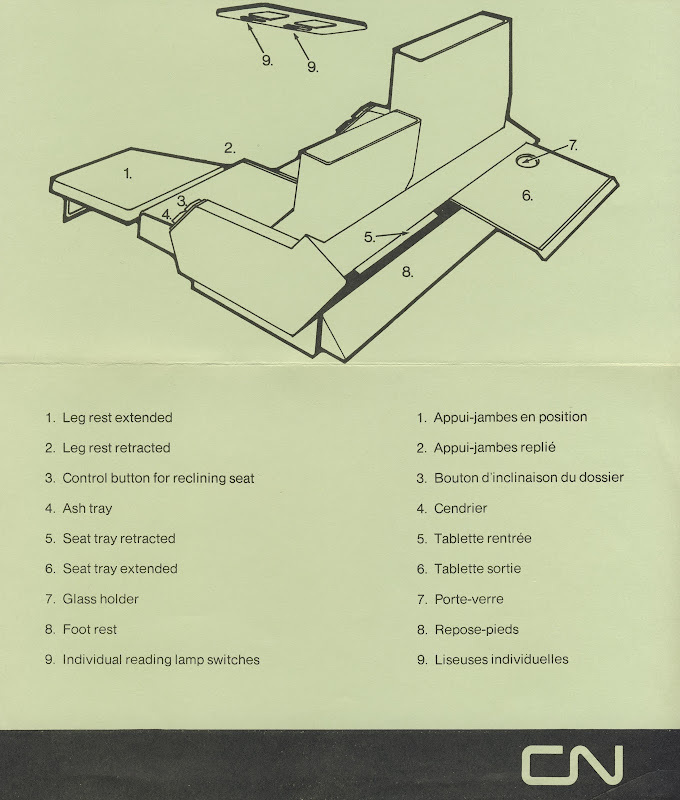 This brings back fond memories of the many trips I took with my wife and/or friends in the 1970s between Toronto and Montreal via Senneterre and Cochrane or Noranda. I don’t recall the interior of the Halifax station from the 1970s but I do remember the train shed (now gone) and the handy connection to the Nova Scotian Hotel (thankfully still there - both the hotel and the connection). The length of GO trains has increased considerably since then. I remember (without fondness) the two-car self-propelled trains that were used on Sundays even when the passenger loads were huge, such as during the annual CNE fair. On Saturdays the normal trains were three-cars. This was hourly service. Now the Lakeshore line trains run every 30 minutes on week-ends and have a minimum of 10 double-deck coaches with a total of 1600 seats and when there is a major event in Toronto they are often standing-room only. Great post, many memories here. Now I wish I was born 35 years earlier. I love Via Rail, but this looks simply amazing. My new big project: Sharing the wonders of Canada with the whole world! Want to become part of it? You can by helping me! Thanks.....looking back now those difficulties with the rail strike were only minor and I’d do that trip again in a heartbeat. And the nice thing.....it might not be in an old heavy-weight sleeper but I can still get to Senneterre or Jonquiere by train! Great photos and great story! Years ago, I got took at a old timer's collection of photos and mementos from a journey he did in Western Canada on CP trains and ferries from Toronto and back in the early 70s; the thing that cracked me up the most was the copy of his CP Card statement for a mere 1300.00 for the entire 3 week trip on nothing but CP trains, CP ferries, CP hotels and even CP food from all modes! New Westminster to Amtrak 516, whats up with the extra 4 axles, over? It was indeed interesting that up to the late 1970s it was possible to have an extensive trip from, say, Toronto and rarely set foot off Canadian Pacific property. I had one trip that included The Canadian, an Alaska cruise and two CP ferries as well as CP hotels. I had another trip which involved The Canadian westbound and CP Air eastbound as well as CP hotels and ferries in the west. The airline was the first to be sold off, followed by the Canadian, the cruise ship and the ferries, then the hotels. NeoArashi wrote: Now I wish I was born 35 years earlier. Next vacations are in late august, but I think I'll do this weekend getaway at least once before then. Pretty cheap too. Last time, it cost me under 200$ for this, Sleeping at a motel in Jonquiere, and at the HII-Montreal (youth hostel) in Montreal. AgentSkelly wrote: Great photos and great story! Years ago, I got took at a old timer's collection of photos and mementos from a journey he did in Western Canada on CP trains and ferries from Toronto and back in the early 70s; the thing that cracked me up the most was the copy of his CP Card statement for a mere 1300.00 for the entire 3 week trip on nothing but CP trains, CP ferries, CP hotels and even CP food from all modes! The train between Montreal and Jonquiere is a favorite......and they‘re well used. Approaching Riviere-a-Pierre the Service Manager will come through the coach and ask all to remove bags, parcels etc as he’s going to need every seat. The parking lot at the small station is full, coolers and boxes are loaded into the baggage car and the passengers pile on. Here the roads end and every few miles we stop to let someone off to be met by an ATV..... or a snowmobile in winter. Then just as fast....we’re out of the woods and into the populated (200,000 ) and industrial Saguenay-Lac St-Jean region. I usually tie a trip to Jonquiere with a ride on the frequent Intercar bus to or from Quebec City....just gives you more options. 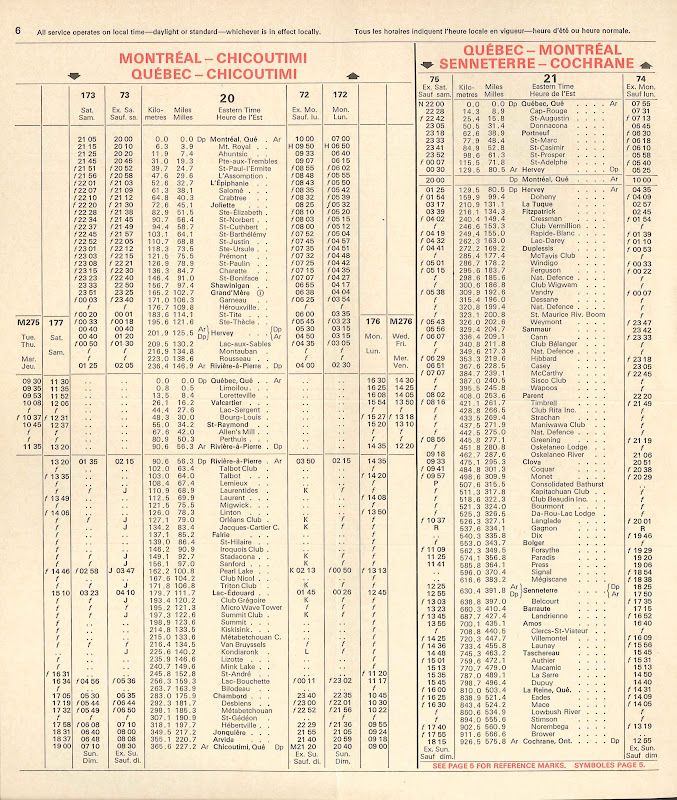 But back in the day there was train service between Quebec and Chicoutimi through Valcartier and onto Riviere-a-Pierre that lasted into the VIA era. Yes.....the Chargex card as VISA was known back then or BankAmericard in the US and it reminds me of a trip on Amtrak in the mid ‘70s. I arrived in Boston from Halifax and went to South Station to begin a USARailpass adventure. No problem there using my Chargex card at the Amtrak Ticket Counter for my pass or subsequently for other tickets or in dining cars until dinner the first night out of Chicago on the Southwest Limited (now Chief). Dining Car Steward “we don’t take no foreign credit cards” .....me....”yes Amtrak does”. “I don’t” “you might not pay-up before you leave the country” So it was back to cash until we reached LA!